The second Taiwan-Japan High School Baseball Exchange Series for 4 days successfully concluded in Taichung on December 27, 2016 won by Ping-Jen S.H.S. to the delight of Taiwanese fans. Managers of all the 4 teams valued the brief but succession of intense match-ups highly because they learned a lot from the international games. The winners, however, were all the young players as they created enormous goodwill both inside and outside of the ball park. 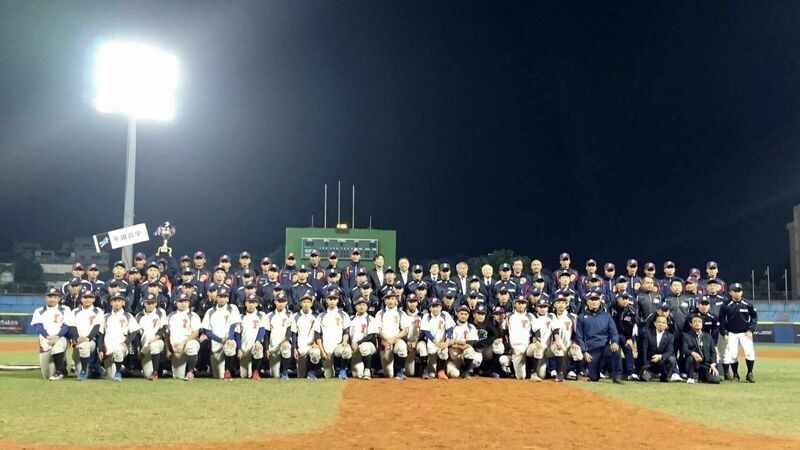 The final game was also a close battle, but Taoyuan Ping-Jen S.H.S., the champion of Taiwanese high school baseball, won 3-0 against Osaka All-stars with half of their 18 players selected from Riseisha High School, 2016 Koshien champion. At the closing ceremony, Lin Hua Wei, Secretay General of Baseball Federation of Asia, presented a cup to the winner and Masahiko Takenaka, Secretary General of Japan High School Baseball Federation, congratulated the success of the Series thanks to the efforts of officials, volunteers, MAZDA and other supporters, and revealed that 3 Regional High School Federations: Chiba, Gifu and Wakayama, plan to visit Taiwan at around the same time in December, 2017. Pitcher 朱益生(Pin-Jen) was awarded M.V.P. and 4 players won fighting-spirit award; 張偉聖（TCAVS）, Yuma Fukumoto (Nara), Hisanori Yasuda (Osaka) and 林靖凱（Pin-Jen）. Alex Shu (周奕丞)　who is studying at Fukuoka Daiichi High School in Japan acted as valuable liaison and interpreter for the two Japanese teams.